The combination between maximizing visibility and minimizing frame components is what characterizes this state of the art system. With its invisible wings & frames and middle joint measuring a mere 21mm, HIFINITY frees your living spaces from visual obstructions. Whether manual or motorized, the quiet & fluid movement of HIFINITY speaks excellence, beauty and sophistication. With its wide range of solutions, HIFINITY will be able to accommodate your structure’s necessities while achieving your aspired design. The system is brought about by turning the conventional principle behind window construction upside down, HIFINITY has started a genuine revolution: as the frameless glass now takes on the load-bearing role formerly assumed by the aluminium frame. The entire space can then be dedicated to transparency. This fundamental technical principle, simple yet requiring complex technology, paves the way for innovative developments, an infinite range of versions and solutions tailored to customers’ specific needs. European quality at it’s absolute finest. We are partnered with Reynaers Aluminium to bring you the best quality in aluminium glazing systems and accessories. Quality labels are often achieved by companies to showcase the superior quality of their products or services. Building with a quality label assures the product’s compliance with international regulations and standards. Moreover, it contains many advantages that improve the overall performance and the value of your building. Many governments also encourage building with a quality label, by providing subsidies or tax discounts when using certified building components. Choosing certified Reynaers systems is a very wise long-term investment. Their life lasting material quality is ensured thanks to the ISO 9001 and CE-quality labels. The quality of the coating and anodising is guaranteed thanks to our dedicated Qualicoat and Qualanod certification. To complete the picture, Reynaers offers a 10 year guarantee on all systems and a 5 year guarantee on accessories. This European quality label ensures the high quality of our materials and their compliance with European legislation. Furthermore, it guarantees that the fabricator assembles the systems, according to the processing requirements of Reynaers Aluminium. Reynaers fabricators are trained to obtain the CE-marking. In this way, you can be confident that with a Reynaers fabricator, you have the highest quality of materials and installation. Reynaers offers a large range of accessories for the building envelope. Of course as well as their beauty and elegance, safety is also an important consideration. 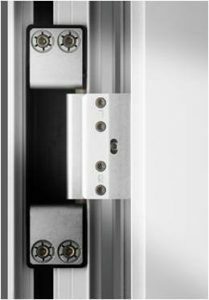 Reynaers systems can be equipped with special accessories, like handles fitted with a key and safety cylinder. In line with its minimalistic building concept, Reynaers developed a series of refined and elegant handles. These handles perfectly blend into the overall image of your windows, doors and sliding systems. They can also be ordered in exactly the same colour as the selected profile, assuring a perfect match. In addition to Orchid, Shield and Horizon, our most recent development in the field of handles, is Purity design handles. Hidden hinges bring an added value to the aesthetics of your windows. By choosing hinges that are integrated into your windows, you avoid getting them damaged or soiled, while attaining a more beautiful and discrete effect. These hidden accessories can be used in various types of Reynaers turn -and tilt windows. Reynaers systems are designed to meet different levels of thermal insulation. This insulation level is called the U-value. The lower this U-value is, the higher the insulation. This insulation level is realised by a thermal break between the inner and outer aluminium profiles. Profiles of Reynaers also have a unique center seal or gasket and a continuous acoustic seal, to ensure the insulation. The state-of-the-art insulation technique used by Reynaers, connects the outer chamber and the inner chamber through fiberglass reinforced polyamide strips. These strips provide a thermal break and come in various widths. The wider strips, the higher the insulation factor. The design of these strips is important to guarantee the stability and strength of the assembled profile. Insulating of the profiles is done in a specialised department, called ERAP. To indicate to what extent a material is thermally insulating, the term thermal transmittance or U-value (formerly known as K-value) is used in the construction industry. The lower the U-value, the higher the heat resistance of a material, meaning the better the insulation. For an optimal match between profiles and glazing you should take into consideration the U-value of both. Reynaers systems respond to the requirements of the European directives as well as various international standards on energy performance. When it comes to design freedom, aluminium is the material of choice. Styles, shapes, dimensions, opening types, colours, accessories,… You can decide everything yourself. This allows you to express your own personality in the building style of your project. Reynaers window -and windowdoor systems come in six style variants which you can choose from. These styles have everything to do with your personal taste and the style of your building: modern and stark or classically shaped. Depending on your wishes, there is always a profile that meets your needs. Aluminium windows and doors come in almost every dimension. Large spans or even elements up to 3 meters in height are possible. Together with your architect, you can virtually design your windows and doors yourself. Your Reynaers fabricator supports you in providing all the details about minimum -and maximum dimensions. Modern and minimalistic architecture often features large glass surfaces that offer many advantages: your rooms get filled with natural daylight, they look more spacious and you can enjoy a beautiful view. Moreover, when oriented properly, large windows can provide lots of passive solar gain. The architect plays an essential role in the positioning of your windows. If you envision a special concept for the windows in your building, it is important to discuss this with your architect in an early phase of the design stage, as the construction of the building needs to be appropriate for the desired solution. Reynaers’ aluminium systems make it possible to realise large glass surfaces up to 3 meters high and 6 meters wide. 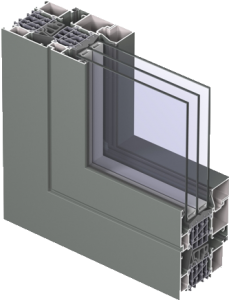 Depending on the chosen system, glass -or packing elements from 4mm to 65mm can be fitted into aluminium profiles. This allows for a broad range of glazing options – from acoustic glass or safety glass, to a highly aesthetical mirror-glass. If necessary, the window profiles are strengthened extra against heavy wind load or the weight of large and heavy glass panes.